Most of us think of self-defense as being able to physically defend ourselves. But there is more to the equation as you also need to take care of yourself both mentally and financially. Being able to physically defend yourself isn’t the only benefit of learning self-defense techniques or being armed with a weapon. 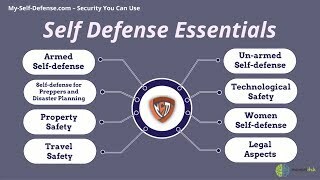 Since physical and mental self-defense is interrelated and it’s really hard to differentiate between the two, here self-defense refers to defending yourself physically. Self-defense can be broadly categorized into two categories i.e. armed self-defense and unarmed self-defense. Using weapons to defend yourself is the most obvious and perhaps the easiest way to deal with difficult situations that involve violence. That’s because not all of us are kung-fu masters and skilled shooters. You don’t need years of training to use most of the self-defense weapons currently available. Thanks to the recent advancements in technology, we can now defend ourselves using pocket-sized weapons. However, what’s important is to know which weapon to use in different situations as there is a wide variety of weapons to choose from. You also need to consider legal restrictions, the type of threat you are dealing with and your own experience. Many regions/states strictly prohibit openly carrying firearms and other types of weapons such as knives, while some allow openly carrying or concealing firearms expressly for self-defense. It’s worth mentioning that everyday items such as baseball bats, kitchen utensils etc. can also be used as improvised self-defense weapons. Here are some main types of weapons you can use for self-defense. You should choose a weapon you are most comfortable with and can easily carry most of the times. It should also be easily accessible so you are able to use it the moment you encounter a violent attack. Most of these weapons are legal and can easily be tucked inside a purse, bag or a jacket. Your own body is the ultimate self-defense weapon. This makes taking self-defense classes important or at least learning the basic tactics to defend yourself. Many martial art styles such as Karate, Jujitsu, Wing Chun, Tae Kwon Do, Kickboxing and Kung Fu are mainly practiced for self-defense, while others are meant to train people to escape attacks or attack-as-a-defense. Defending yourself without any weapon can be classified into three broad categories i.e. physical training, surveillance and safety gear. Physical training such as martial arts requires quite some time to master, but positively affects many other aspects of your life, including ability to focus, better awareness of the surroundings and mental conditioning for all situations. Technology has become an integral part of our lives, making it important to stay safe in an online world. RFID based security systems use Radio Frequency tags and allow only authorized people to enter a specific area. While these systems are mostly used in commercial buildings, you can also use them to secure your home. As a general rule of thumb, you have the right to self-defense in situations where law enforcement authorities cannot prevent an immediate threat that involves violence. However, private citizens in many regions are limited by law about what they can do to defend themselves. Using force that’s more than what’s needed to dispel an immediate threat is known as excessive self-defense. But we don’t have a clear definition of ‘excessive’ that can help determine what’s excessive and what’s not. That’s why we should consider legal aspects of self-defense and avoid getting into stuff that’s illegal or unethical. According to US Violence Policy Center, only 1 out of every 38 firearms-related deaths in the country was justifiable. This makes it very important to understand state and federal laws before buying or carrying any weapon for self-defense. Most aspects of self-defense are common between men and women However, women-specific products are designed to help them defend themselves without having to carry a lot of extra bulk or lethal weapons. Self-defense weapons can prove to be a reliable and convenient source of protection for women who can buy compact, classy and inconspicuous weapons for peace of mind. Pepper sprays have been the all-time favorite as they can be effective and easy to carry. However, pepper sprays have short shelf life and you might end up hurting yourself in a violent situation, especially in tight spaces such as lifts. ‘Failing to prepare is preparing to fail’ sums up the topic quite well. Personal and family safety should be a top priority whether you are camping, alone in the home or even walking to your car. Following safety rules and being prepared cannot guarantee 100% protection all the time. But it does provide you with a confidence boost and minimizes the chances of you turning into a statistic. Trouble can find you anywhere, anytime so your best bet it to be mentally and physically prepared to counter all situations.